Dismantling at -20˚C in summer. 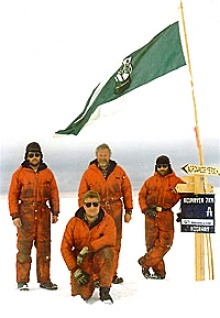 After almost 11 years of operation, the Neumayer Research Station at the South Pole must go. Threatening to the deformation of the ice shelf and continuous snow accumulation the station had grown obsolete. Trendelkamp faced the complex challenge. The existing station, under extremely heavy snow loads, had to be dismantled and relocated. The station contained multiple accommodation and laboratory containers. The containers (30 to 50 meters in length) made of steel with a diameter of 8 meters each. Only one shipping container for everything necessary. The special weather conditions and remote location make comprehensive project management and planning a priority. A critical project element included: all necessary tools, materials and equipment must fit into a 20’ shipping container. Every single item is carefully planned and packed. Departure to the Antarctic is scheduled for the Christmas holidays. Over a two week journey, the ship known as “Polarstern” takes the Trendelkamp team from Cape Town, South Africa to the Antarctic. The project is scheduled to last three months, during the Antarctic summer. The disassembled station is transported in 34 shipping containers to a depot near the ice shelf edge where it was loaded onto a ship. The overall project is a challenge for the employees. A special crew is chosen to withstand the physical and mental stress of such as mission. Trendelkamp designed and build two arctic transportation sleds specifically for the Alfred Wegener Institute for Polar and Marine Research. One sled transports a 15,000 liter fuel container. The other sled, with a heavy duty slide unit, accommodates load capacities in excess of 30 tons to transport 10’ and 20’ containers.